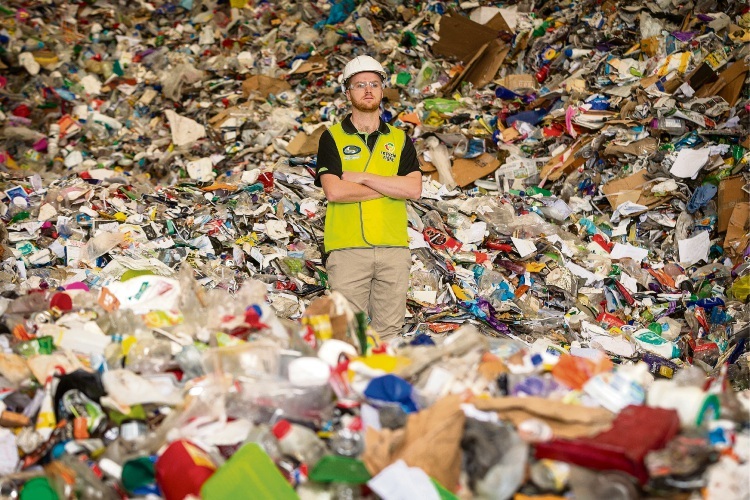 SMRC employee Patrick Hay at the Materials Recovery Facility in Canning Vale. THE Southern Metropolitan Regional Council (SMRC) has moved to allay fears kerbside recyclables are being stockpiled or sent to landfill. Australia sent 1.25 millions tonnes of recyclable material to China in 2016-17. But with the Asian country now enforcing tighter restrictions on imported recyclables under its National Sword policy, the effects are being felt, especially on the east coast. Ipswich City Council in Queensland recently reversed a decision to send recycling to landfill, while there is also talk waste companies are stockpiling materials due to a downturn in the market for plastics and paper. SMRC chairperson Doug Thompson said its Materials Recovery Facility (MRF) was as busy as ever. “The China import ban has had a broader effect on the industry with some materials experiencing a drop in value both before and after the restrictions on recyclables came into place at the start of 2018,” he said. The $20 million state-of-the-art MRF in Canning Vale processes 25,000 tonnes of recyclables collected from yellow-topped bins in Fremantle, East Fremantle, Kwinana and Melville each year. Since the changes, the SMRC now only exports steel cans to China. Mr Thompson said new contracts had been put in place in anticipation of the changes. “The SMRC currently exports materials to countries such as Indonesia, Malaysia and other markets throughout Asia,” he said. In February Melville Council carried a notice of motion which recognised “the urgency of the recent import ban”. The motion asked for the CEO to draft a submission to the Waste Authority as part of a review of the Waste Avoidance and Resource Recovery Strategy, and write to the Prime Minister and other departments “requesting urgent action to support the City and all local governments to address this issue”.“While the SMRC and member councils are well placed comparatively, action is required now by all three tiers of Australian governments to avert a crisis in kerbside recycling,” councillor Tim Barling’s motion read. Mr Thompson said the medium to long-term goal was to develop on-shore processing so Western Australia could turn recyclables into a clean product for “domestic and international consumption”. “Whilst the impacts are being felt throughout the world, the recycling industry in WA is in a different position compared to the east coast and the SMRC would like to stress to the public to continue to place recyclables into their yellow-topped recycling bin,” he said.